Junior Brother is the pseudonym of Co. Kerry native Ronan Kealy. 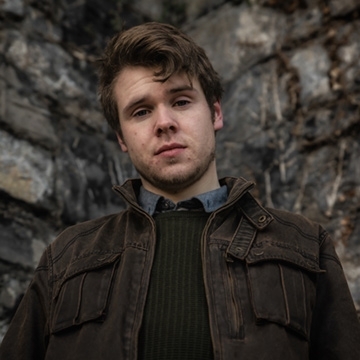 Fusing elements of Irish and English folk with a deeply unique sensibility, Kealy has steadily built a dedicated fanbase in his current residence of Dublin, broadening his listenership further with each release. Ronan Kealy developed a strong love of music from an early age, writing his first song at 9 years old after having taught himself guitar on a banged-up nylon acoustic. A short spell studying English in University College Cork helped Kealy to foster his unique and striking poetic voice. Limerick band PowPig formed in 2017, PowPig are a four-piece consisting of Anna Marie Rooney, Andreea Mocanu, Laura Drennan and Leah O’Donnell. Their debut EP was “Denture Adventure”, Their second EP, “Buzz Buzz” was released in May 2018. Having supported acts such as The Strypes, Pillow Queens, Mongoose, whenyoung and Paddy Hanna, PowPig have also played The Irish Times podcast with Roisin Ingle, plus a late night slot at Body&Soul festival and have scored a new Artist of the Week write-up in The Irish Times.